100% YAK WOOL, SILKY YAK, YAK HANDSPUN, AND NATURAL BLENDS. Hand Knitting Yarn, Toronto Canada. 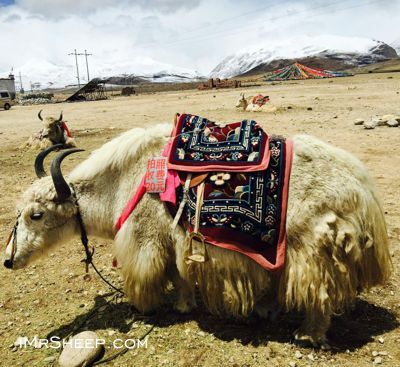 Tibetan Yak takes a rest after serving tourists, Tibet (Xizang, China). Photography © Shi Qiu, imrsheep.com. Photo Gallery: Yak Herders of Ladakh, India » on ArcticPhoto.com © Bryan & Cherry Alexander Photography. Yaks' habitat is the Himalayas (Nepal), China, and as far north as Mongolia and Russia. They are well adapted to the harsh mountains with their thick coats, great lung capacity, and ability to move skillfully over rough terrain. Yaks can easily tolerate temperatures of -40C. Even their blood cells are designed for high elevations. There are both wild and domestic yaks. The Yak has been domesticated to plough fields and pull loads, because it is a sure-footed climber (at a weight of 2000 lbs!). When traveling on snow in single file, they carefully step on footprints left by the lead yak. Yaks are also used for their milk, fiber, and meat. Yak milk can be processed into cheese and butter. Yak butter is also one of the ingredients in Butter Tea, which is traditionally made from tea leaves, yak butter, water, and non-iodized salt. Yak butter is also used in lamps. 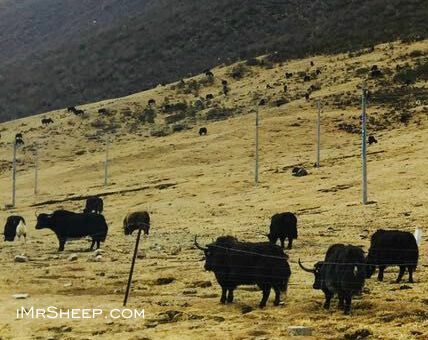 Yak fiber micron count is between 15 and 17 microns that place it in the same class of the luxury fibers such as cashmere, guanaco, vicuña and qiviut. Each yak produces about 100 g of down fibre per year. It comes in a few natural colours: white (the most valuable), fawn, dark grey, and dark brown. The yak down hair is harvested by combing or pulling the fibres during the spring moulting period. Yak fiber is spun and woven into various, very soft and ultra warm fiber products. China (Qinhai, Sichuan and Gansu provinces) is the major producer of the commercialised down hair. "In terms of fiber, these endearing shaggy creatures that easily weight several hundred pounds produce roughly one pound of wooly undercoat a year called yak-kulu, meaning yak cashmere. In fact, when it is carefully processed it can be worn next to the skin. With growing concern about the environmental impact of cashmere goats, fashion designers are now looking to hit the catwalk with yak wool couture instead." How to differentiate between Natural Yak Wool and substitute: Yak and Camel Wool are odourless. They have a very pleasant, warm 'woollen' aroma, and very soft hand reminiscent of Pure Cashmere. Make a hank damp - gently wash it or just pour enough water on some spot. Gently rub, just a bit. If Natural: There must be a very pleasant, light 'woollen' aroma. If the thread smells like a sheep or goat milk - most likely you have a sheep wool substitute. Also, the thread looks rough and 'scratchy' if there is no Yak Wool in it.